Released just a month after being announced at CES, the Pentax MX-1 enters an extremely competitive enthusiast compact camera market, which has heated up significantly after being dominated by Canon and Panasonic for years. Unlike Pentax’s first foray into the interchangeable lens compact camera market, the Pentax Q, which sported an above-average price with a smaller-than-average sensor relative to its interchangeable lens peers, the MX-1 sports specs that are right on the money for its $499.95 price tag and high-end point-and-shoot market. Like the Olympus XZ-2 ($599.99) and Nikon P7700 ($499.95), the Pentax MX-1 is built upon a 12-megapixel, 1/1.7-inch backside illuminated CMOS sensor. Not only does it deliver admirable specs for the price—such as a bright 28-112mm equivalent f/1.8-2.5 4x zoom lens; a high-resolution 3.0-inch, 920,000-dot tiltable LCD; and a wide ISO 100 to 12,800 sensitivity range—but it also shoots 1080p 30fps HD video as well as JPEG, Raw, and Raw+JPEG stills, and offers an HDR mode. On top of the competitive specs and feature set, the MX-1 also delivers in the one area the Pentax Q really did shine: design. With a vintage rangefinder-styled look that rivals Fujifilm’s popular X Series for its retro appeal, Pentax takes the trend one step further by using painted brass panels that are intended to wear and develop a patina over time. The retro trend—arguably begun when Olympus first revived its iconic PEN design for its interchangeable lens compact cameras—has proven attractive to the enthusiast market that the MX-1 is targeting, and Pentax’s use of an SLR-like interface with the MX-1 no doubt targets that same market of enthusiasts. 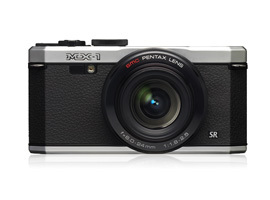 DxOMark testing reveals that the Pentax MX-1 is a serious challenger to the established high-end compacts. With an Overall Score of 49, it’s among the top scoring compact cameras selling for under $500, rivaling proven performers like the popular Canon PowerShot S110, which sells for $449.99 (and its predecessor the S100) and the Panasonic DMC-LX7 ($449.99). The MX-1 performed competitively across the board, with a Portrait Score of 20.4 bits and a Landscape Score of 11.3 Evs, and stood out particularly for its low-light performance with Sports Score of 208 ISO, which was the best score among compact cameras selling for less than $500. While the Canon PowerShot S110 and Panasonic Lumix DMC-LX7 are the latest of popular and proven multigenerational lines from their respective makers, the MX-1 is the first high-end enthusiast compact from Pentax. Nevertheless, the MX-1 holds its own when we compare the three cameras head-to-head. In fact, with a DxOMark Overall Score of 49 points, the MX-1 should deliver a very similar image quality level as the S110 and LX7, which scored 48 and 50 respectively. All three cameras have practically the same scores on both color depth and dynamic range. The one score where we see the MX-1 gaining a slight advantage is its low-light ISO performance, where it exceeds the S110 by 1/3 of a stop and the LX7 by a 1/2 stop. As you can see from the Color Sensitivity graph below, for high ISO between 1600 and 12800, the MX-1 was able to score 2/3EV higher than the Canon and Panasonic cameras, indicating that in low light and higher ISO settings it can produce images with greater color depth and nuance. Where the LX7 was able to beat both the Pentax and Canon cameras can be seen in the Dynamic Range graph below. The LX7 is slightly superior in dynamic range, beating the other cameras by 1/3EV at ISO 80, indicating that in bright light and low ISO settings it will be able to produce better details in highlights and shadow. Two slightly higher priced enthusiast compact cameras that compete with the MX-1 are the Olympus XZ-2 iHS ($599.99) and the Sony Cyber-shot DSC-RX100 ($649.99). The Olympus XZ-2 and MX-1 have the same Overall Score of 49 and perform almost identically across all three use case scores, which comes as no surprise given that they likely utilize the same 12-megapixel BSI CMOS sensor. The Sony RX100, on the other hand, sports a much larger 1-inch CMOS sensor and is therefore able to achieve higher marks across the board, with an Overall Score of 66, essentially performing a full stop better than the MX-1 and XZ-2 as well as the Canon S110 and Panasonic LX7. In fact, the RX100 is able to beat the MX-1 and XZ-2 by 1.5 stops in color depth and 1EV in dynamic range. And in low-light shooting it wins by nearly one full stop, indicating that it is a better option for sports photography—again, no surprise given its larger sensor. Other interesting comparisons to make are the similarly priced Nikon Coolpix P7700 ($499.95) and Samsung EX2F ($499.99), as both also have 12-megapixel 1/1.7-inch sensors. The Samsung EX2F’s sensor scores are not yet available, but you can see that the Nikon scores very similarly to the MX-1, but with a slightly higher Overall Score of 53. We’ve also included a comparison with Pentax’s latest interchangeable lens compact, the Pentax Q10, which sells for $599.95 with a 3x zoom kit lens. The Q10 actually has a slightly smaller 1/2.3-inch CMOS sensor, but achieves an Overall DxOMark Score of 49—which is equivalent to the MX-1’s score and indicates similar image quality—by using the approach of interchangeable lenses rather than the point-and-shoot approach of the MX-1. Although Pentax is a bit late to the high-end compact camera party, the MX-1 is a solid entrant. With good low-light performance, the MX-1 is well suited for capturing sports and delivers image quality that rivals its more established competitors like the Canon S110 and Panasonic LX7. It’s heftier than most of its competition, especially the slim S110, but Its retro design will appeal to high-end, enthusiast shooters who don’t mind carrying a bit more bulk in return for style.